When the team first saw this property it was essentially a car park! Parking for 2 cars and a tiny tiled patio were removed, and the space completely redesigned. The secret for any small back yard is to use every square inch – making every element functional and beautiful. The design for this project divided the space into 3 zones: an entertaining and lounge area directly off the terrace, the pool in the centre to accommodate a level change, and a grassed play space for children that doubles as off-street parking. A timber day bed is split by the glass pool fence, providing a pontoon and sun bed on one side, and an outdoor shower on the other. 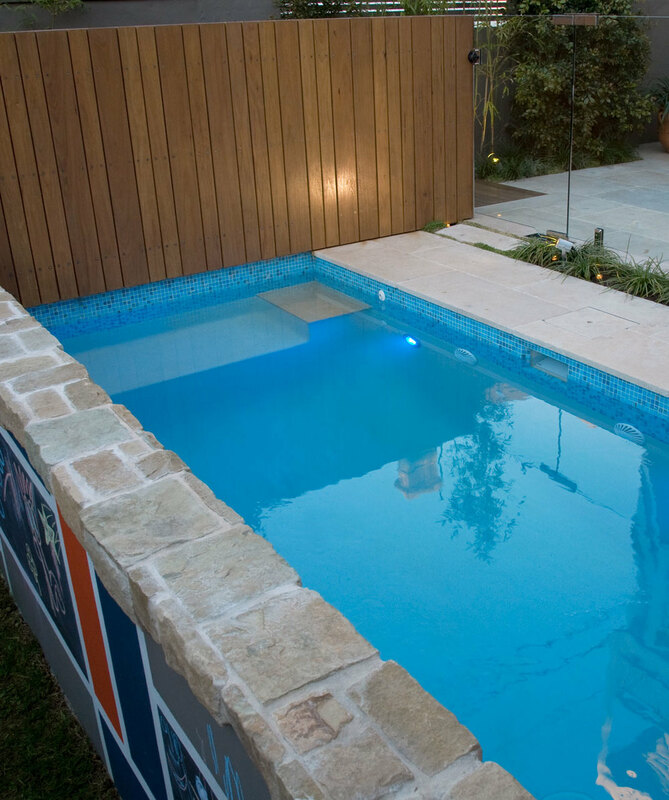 The plunge pool has an extended wall which does duty as pool safety fencing, and features ashlar Clancy stone from EcoOutdoor on one side, and a kids’ drawing wall on the other. A hardwood timber bridge and stairs at one side hide the pool equipment from view.